In many cases, relatively inexpensive treatment and equipment is all that is needed to enable a child that has been restricted to crawling on all fours, to stand and walk, significantly changing his or her life forever. Please watch the video on our homepage to see the direct impact our work has on beneficiaries lives. to children and youth living with disabilities in the Democratic Republic of Congo. “I came to StandProud when I was 19. Prior to this, I had been crawling on all fours for fourteen years, not having the financial resources to get any treatment. Addressing the special needs of people with disabilities is difficult in many developing countries, but the situation in the Democratic Republic of Congo (DRC) is among the worst anywhere. 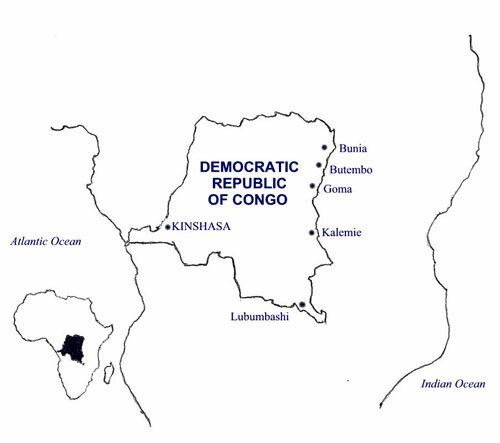 DRC, a country of approximately 55 million people and geographically the size of the United States east of the Mississippi River, never achieved a high rate of polio vaccination and is one of the last bastions of wild polio virus. Its population counts a disproportionate number of polio-affected disabled persons. In addition to polio, frequent meningitis epidemics and risky, ill-advised medical practices (such as injections of quinine to the hips to treat malaria) have added to the large numbers of people living with physical disabilities. Disabled people living in the Western world are fitted with "leg braces" that assist them to walk and provide them greater dignity and independence. In the Congo, most disabled persons do not have access to this basic equipment, either because there are no brace-making facilities near where they live, or because the they cannot afford the fees. Most disabled persons thus end up hobbling or crawling around as best they can. StandProud works with a Congolese partner organisation 'ACDF ' to provide surgery, leg bracing, phisical therapy and rehabilitation to disabled children in the Congo. We suplement our mobility enhancing services with educational support. The StandProud-ACDF collaborative project offers support to children living with disabilities by setting up brace-crafting shops and providing free equipment for as many disabled Congolese youth as possible. With StandProud support, ACDF currently maintains brace-crafting facilities in six cities in DR Congo: Kinshasa, Lubumbashi, Kalemie, Goma, Bunia and Butembo. The outermost of these sites are located approximately 1000 miles from each other and correspond to the west, southeast and northeast corners of the country. In 2008 alone, StandProud USA financed 49 corrective surgeries, paid the school fees of more than 240 disabled children, and provided approximately 3000 new braces, replacements of equipment, and repairs. A significant number of young people living with disabilities in the DRC thus benefited from the program, enjoying enhanced mobility and dignity. StandProud UK is now working with StandProud USA and ACDF to ensure that the children and youth whom we have been able to assist continue to receive support and brace repairs and that with the help of our supporters, we can continue to offer mobility enhancing services to the many children on our waiting lists. StandProud and ACDF work together to help children and youth living with disabilities to lead fuller, more mobile and independent lives.